I got a lot of compliments, very nice. Carolina Weavers Riveting Shag Collection Ember Multi Shag Area Rug (7'10 x 10'10) - 7'10" x 10'10"
Carolina Weavers Riveting Shag Collection Depicted Circles Multi Shag Area Rug (5'3 x 7'6) - 5'3" x 7'6"
Carolina Weavers Riveting Shag Collection Ember Multi Shag Area Rug - 5'3" x 7'6"
Woven in 100-percent olefin, this shag rug features a plush pile. This plush shag rug offers instant color and whimsy to your family room, den, children's bedroom or any other space in your home that feels neglected or needs to be enlivened. Take your shoes off to feel the luxuriant texture of this area rug that is as comfortable as it is eye-catching and versatile. Dimensions 90.0 In. X 63.0 In. X 0.75 In. Great thickness and colors are very vivid. Perfect for our family room ! 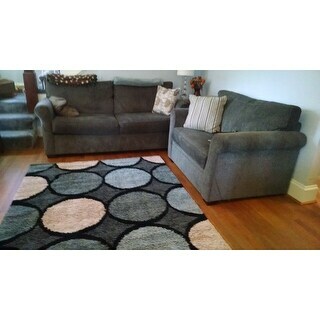 Beautiful area rug but very thick and shaggy. Good quality, very nice colors and pattern. Would be great in a larger room with hardwood floors away from any doorway. Rug was very thick and shaggy which kept me from being able to close the door to the room I was putting the rug in. Very soft and plush. I purchased this rug for my son's room. I loved the colors and the dots and though it can look great in a boy's room. Not having very high expectations BUT hoping for a good rug, I was completely surprise. 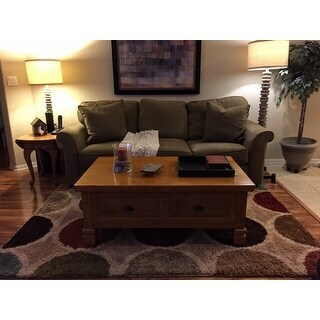 The rug was beautiful, the colors are better than the picture and quality is great. Its fluffy, soft and great to roll and play on. Family members that have seen it have asked for the website. It was the perfect rug for my living room. I love it! Love this rug it is so plush & soft to walk on. The colors are rich looking & true to picture except there isn't any ivory in the rug. The rings around the colored circles look ivory in picture, but are actually beige. Really not a problem though have received lots of compliments. I was also pleased with the fast delivery. Couldn't have picked a better choice. Needed a rug that pulled together all the colors in my room, PLUS was a shag to match the other shag rug beside it. 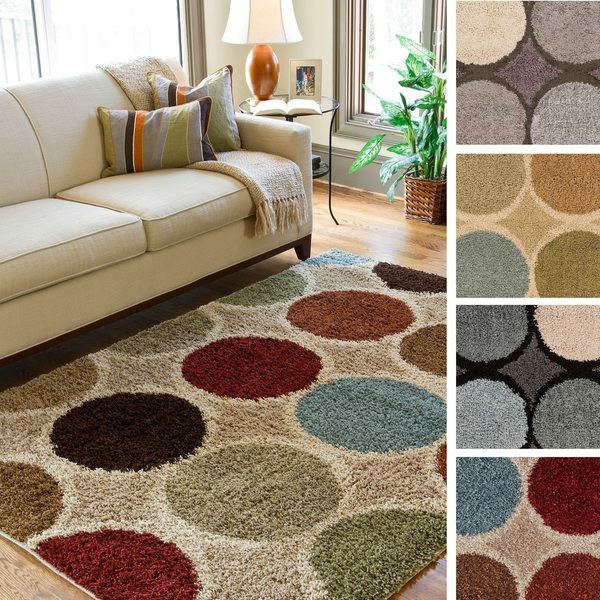 Love this plush, colorful rug... Looks even better that pictured! this rug ties everything in my living room together. I was reluctant to purchase another area rug after a bad experience with another rug losing strands of pile every time I vacuumed. I haven't had to deal with that with this rug. So far (three months) so good. Love the rug! Exactly what I wanted. Very, very happy with this rug! The colors (the grey and blue version with the black outlines) work perfectly in my room with grey couches and pale blue walls and it passes the barefoot comfort test. Fast shipping & awesome product! I love the contemporary/vintage look of this shag area rug. It looked great when I put it down, but the pile very quickly got matted down, so after about a year I had to replace it. I bought this carpet 4 years ago and it has stood up to a lot of wear and tear. Our little Pomeranian practically lives on this carpet as she likes to hide out under the coffee table. The other day I spilled a lot of nail polish on it and after a lot of cleaning and a bottle of nail polish remover I got most of it out. I considered buying a different carpet but I knew I liked this one and the price was right. I bought it again so I guess you could say that I really love this carpet and that it has withstood the test of time! The quality of this rug is excellent . Everything I could have ask for. A great price for a great rug. I purchased this rug a while ago, I still love it. It looks great in my space and it's so soft and inviting. This was the perfect addition to our den! Great quality and beautiful colors! Nice and plush. Love it in my bonus room! I got this rug in the beige and I love it. It is soft and looks perfect in my living room. The colors for this one look more like the main picture of the rug with the couch then of the picture labeled beige, which I am very happy about. "Is this available in a larger size ?" Unfortunately no, this is the only size available. "In the Brown model are the circles outlined in black or brown? Also it appears grey, beige or is there light brown in it. 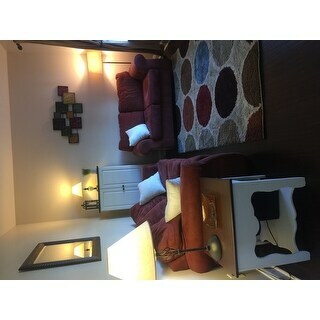 Trying to tie together brownish and grey room"
The brown model has taupe colored lines. It would coordinate well with a brownish grey room. "Is this an outdoor rug too as noted?" This rug is recommended for indoor use only. We apologize for any inconvience. "Previous purchasers of this rug, do you own dogs? Do their claws get caught in this?" Hello nicpot, we can appreciate the fact you want a firsthand account of the product. You will receive an email notification every time you get a response. Thank you for shopping with us. Copper Grove Sand Ridge Multicolored Modern Area Rug - 5'3" x 7'6"